The VW Tiguan is a sleek SUV with lots of useful features that can improve your drive. So, which trim level is right for you? Toms River Volkswagen looks at all four of the Volkswagen Tiguan trim levels to help drivers in Toms River, Brick, and Freehold decide. The Volkswagen Tiguan S is the base trim. It sets the foundation with a 2.0L TSI 4-cylinder engine. This powertrain gets 184 horsepower and can be found under the hood of all four of the SUV’s trim levels. You’ll be in for a fun drive with an 8-speed automatic transmission with Tiptronic® and Sport mode. The exterior features LED headlights, taillights, and daytime running lights, while your sides are fitted with heated side mirrors with integrated turn signals. This trim also sits on 17-inch alloy wheels. Inside there’s cloth seats, a 3-spoke multi-function steering wheel, and a 6.5-inch color display for your radio. For keeping your phone charged, there’s a USB port in the center console. You’ll also have great air quality inside this SUV. The single zone climate control is equipped with a helpful pollen filter. The next trim is the Volkswagen Tiguan SE. It runs on the same drivetrain but adds features to boost the style, safety, and convenience. For starters, it’s easy to get going with this trim, thanks to a remote start feature and keyless access. Once you’re inside, you’ll see that there’s now a leather-wrapped steering wheel and the seats are covered in V-Tex leatherette upholstery. When you’re behind the wheel, you can get comfortable with the 10-way power driver’s seat with adjustable lumbar support. Plus, for the colder months, there’s now heated seats. You’ll also get a few significant upgrades to your infotainment system. An 8-inch color display is now standard and features lots of music options with SiriusXM® Satellite Radio. More passengers can charge their phones too, with two USB ports up front and one in the back. There’s more technology keeping you safe in this trim too. Driver assistance features will be protecting you on all sides by looking out for your car with technology like a Blind Spot Monitor, Rear Traffic Alert, and Front Assist with a Forward Collision Warning and Autonomous Emergency Braking. 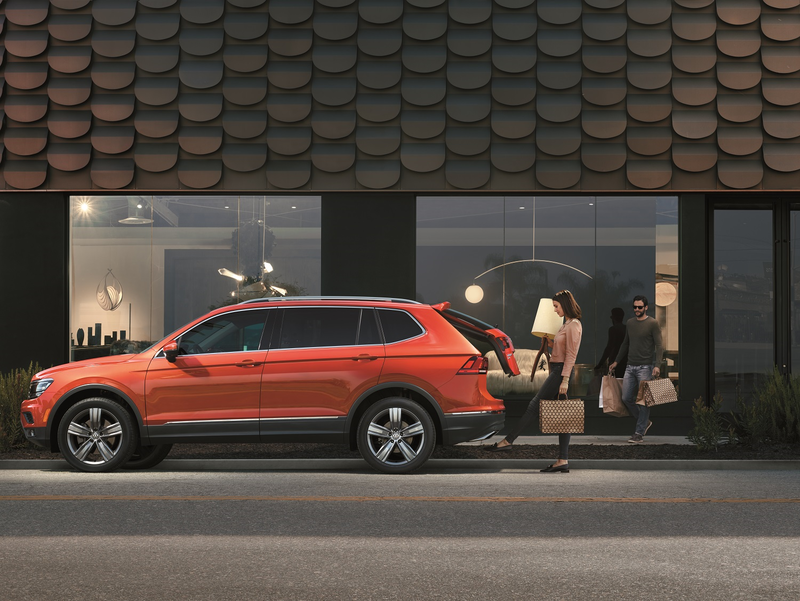 The VW Tiguan SEL continues to upgrade your style and functionality with 18-inch Nizza alloy wheels, silver roof rails, a remote start feature, and a remote power opening and closing liftgate. 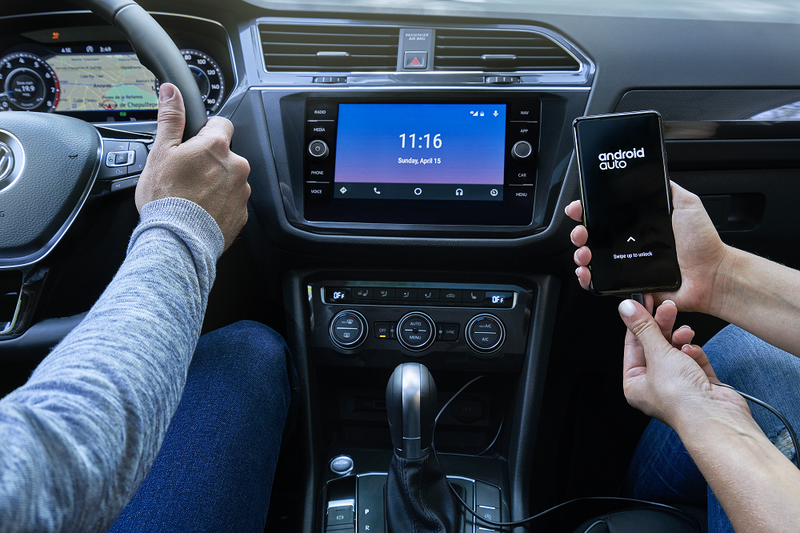 Inside, you’ll now have a voice-controlled navigation system with Volkswagen Car-Net® Guide & Inform and SiriusXM Traffic™ and Travel Link®. During your drive, your SUV will be able to help you maintain a safe speed with Adaptive Cruise Control. It can adjust your speed based on the flow of traffic and even stop your car if traffic gets too heavy. The final trim level is the Volkswagen Tiguan SEL Premium. It sits on refined 19-inch Victoria Falls alloy wheels and has convenient features on the exterior like power folding side mirrors and Rain-Sensing Windshield Wipers with heated water nozzles. It also makes loading cargo easy with the Hands-Free Easy Open and Easy Close Liftgate. The interior now has refined leather seats and a Fender® Premium Audio System for superior sound quality. It also features the Volkswagen Digital Cockpit; it’s a 12.3-inch high-resolution display that serves as your instrument cluster. This trim also watches out for you with a Lane Departure Warning and lets you know if you’ve begun to drift out of your lane. Visit Toms River Volkswagen to look at all the Volkswagen Tiguan trim levels and take a test drive. This SUV offers a safe and comfortable ride to drivers in Toms River, Brick, and Freehold.